Most countries have regulations that apply to wastewater and stormwater discharges. In the United States federal regulations promulgated by the Environmental Protection Agency (EPA) under the Clean Water Act apply to both wastewater and stormwater discharges to either sanitary or storm sewer systems, and to direct discharges to receiving water bodies such as rivers, lakes, bays, and the ocean. These regulations are implemented through the National Pollutant Discharge Elimination System (NPDES) wastewater permitting program. In Canada the federal regulations are managed by Environment Canada, Wastewater Systems Effluent Regulations. State, provincial and local regulatory agencies have the authority to promulgate additional wastewater and stormwater regulations as they see fit, as long as the regulations are not less stringent than the country/federal requirements. It is essential that each manager contact the local sanitary district or agency as well as the state/provincial water pollution permitting authority for comprehensive information on wastewater and stormwater regulations pertaining to his or her specific campus. Federal wastewater regulations are broadly separated into two categories: those dealing with direct discharges and those dealing with indirect discharges. Direct discharges of sanitary sewage by campus-operated wastewater treatment plants into receiving water bodies are subject to effluent limitations and standards and must have national wastewater permits. Indirect discharges of campus sewage into sanitary sewer systems that are ultimately treated off site at local wastewater treatment plants are governed by pretreatment standards and often are regulated by industrial wastewater discharge permits issued to campuses by the publicly owned treatment works. Most campuses are regulated as indirect dischargers and are therefore governed by pretreatment regulations. There is an increasing trend toward heightened regulation and enforcement of all wastewater and stormwater discharges, especially at the state, provincial and local level. Complex state, provincial and federal hazardous waste disposal regulations will continue to restrict wastewater disposal practices in the future. Compliance with current and future wastewater and stormwater regulations will require closer cooperation, coordination, and communication between campus environmental resources and facilities management personnel. The best method of determining an average sewage flow is to use historical flow information from flow measurements compared with population, users, and number of faculty and students. This then allows the estimation of flow on a per-person basis, which can then be used to predict future flows for growth or new facilities. In the absence of historical flow information, sewage flows can be estimated based on typical unit sewage generation rates developed for the particular uses. Table 1.1 below summarizes typical unit sewage generation rates. Metcalf and Eddy, “Wastewater Engineering Treatment and Reuse,” McGraw Hill, New York, 2003. The sewage flows noted in Table 1.1 are daily average flows. Typically, sewage flows follow a diurnal pattern based on the usage patterns of the Community. 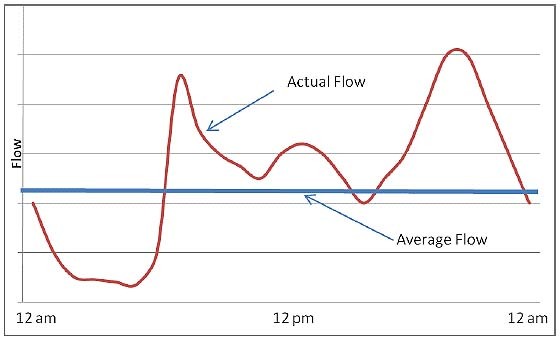 Figure 1.1 below shows a typical diurnal flow curve for residential sewage generation. The components of a wastewater collection and treatment system must be designed to manage average and peak flows. The peak sewage flow is calculated by applying a peaking factor to the average flow value. Similar to the unit sewage generation rates, historical information is the most reliable method of determining the peaking factor. In the absence of historical data, a peaking factor can be calculated using a variety of methods, the most common being the Harmon Peaking Factor. In addition to the sewage generated by the users of the system, the infiltration/Inflows into the system must also be estimated. Infiltration is water entering the collection system from a variety of connection points including service connections and groundwater through cracks in the pipes, maintenance holes, and defective joints. Inflows are direct connections where surface water enters the collection system. Inflows can result from foundation drains, roof water leaders, and cross connections to the storm water system. The Manning’s Roughness Factor varies depending upon the pipe material. Typically, 0.013 is used as the design Manning factor. In cases where the minimum slope cannot be achieved, the slope for a 200 mm and 250 mm sewer can be reduced to 0.28% and 0.22%, respectively. Typically, most colleges and universities discharge sanitary sewage directly into a municipal sewage collection system and the municipality is responsible for the treatment of that sewage. In these cases, most municipalities have a sewer use bylaw that regulates the contaminants and constituents within the sewage that can be discharged to their system. Typical sewer use bylaws regulate biological oxygen demand (BOD), total suspended solids (TSS), specific metals, pH, temperature, and specific inorganic compounds such as chlorides and sulfates. For collection systems that do not discharge into a municipal system, a specific wastewater treatment facility will need to be constructed. The requirements of the wastewater treatment facility will be a function of the receiving water characteristics and the local approval authority regulations on the treated effluent discharge. The design of sewage treatment plants is specific to the particular application and is not addressed in this chapter. Sewage in a gravity collection system is often pumped by a sewage pumping station to discharge the sewage at a higher elevation. Typically, sewage pumping stations are designed to operate continuously with backup capabilities for mechanical and electrical equipment and the provision for operating during power failures to ensure that the flow of sewage is not impacted by a failure or a power outage. Sewage pumping stations are typically required to pump the design peak instantaneously as the sewage flow is received at the station. The design flow is usually expressed as the firm capacity of the station, where the firm capacity is defined as the station capacity with the largest unit out of service. To ensure that this firm capacity is maintained, the station needs to have redundant equipment to allow the station to operate during equipment failures. Sewage pumping stations should be accessible by maintenance vehicles during all weather conditions, and need to be secured to prohibit unauthorized access; this is typically accomplished through security fencing and locked access hatches. Sewage pumping stations and electrical equipment should be protected from damage during any significant flooding events and should remain operational and accessible during these events. Sewage pumping stations and electrical equipment should be protected from damage during any significant flooding events and should remain operational and accessible during these events. Sewage pumping stations should be designed in a manner to ensure the safety of the operators and maintenance staff in accordance with local regulations. Typically, sewage wet wells are defined as confined spaces and require special considerations for access. In addition, sewage can contain flammable materials as a result of spills or methane buildup within the sewers. As such, the sewage pumping stations may be defined as requiring explosion proof design in accordance with National Fire Protection Association Standard 820. Sewage pumping stations are designed to pump the peak instantaneous design flow, with the largest unit out of service. This results in a minimum of two pumps in any particular station. Depending upon the economics and the size of the station, more than two pumps may be required. Pumps can be either constant or variable speed. With constant speed pumps, the pumping rate is fixed by the pump design. In a variable speed pump, the pumping rate will increase or decrease with the speed of the pump. Typically, if the sewage is discharged to a large municipal collection system, constant speed pumps can be used. If the sewage is discharged to a small municipal system or directly to a sewage treatment plant, the constant speed pumping can result in spikes of flow entering the sewage treatment plant, impacting the plant performance. For cases such as this, a variable speed pump results in a steadier flow discharged to the sewage treatment plant, resulting in better plant operation. Benching is provided on a wet well to prevent solids depositing within the corners of the wet well. The benching is directed towards the pumps to allow the solids to move towards the pumps where they can be removed and discharged to through the forcemain. If a standby generator is not provided, the wet well can be sized to provide sufficient detention storage in the event of a failure of the main hydro feed system. The sizing is based upon the length of time for the operations and maintenance personnel to respond to an electrical failure and connect and operate an emergency pumping system. Usually a coarse bar screen (screen spacing 25 mm to 50 mm) is provided on the inlet sewer to prevent large objects from entering the wet well and damaging the pumps. During a power failure, typically sewage will still be received by the sewage pumping station. In this case, a standby power generator is installed to provide power to the pumps while the main power feed is not in service. The requirement for a standby generator can be eliminated by constructing a larger wet well that will provide sufficient detention to capture the sewage until power or pumping to the station can be restored. Typically these wet wells are sized based on the expected sewage flow and the time required for operation and maintenance staff to attend to the station and install a temporary pumping system or standby power generator. Typically, sewage pumping stations are controlled via an electronic level control system. The level control system measures the water level within the wet well and turns on the pumps as the wet well level rises above a particular set point. As the pumps operate and the wet well is pumped down, the pumps are shut off at a particular low water level. In most modern pumping station designs, this level control is provided through well type pressure sensors or, more commonly, ultrasonic level devices. In addition to the main control system, the pumping station should have a backup control system that will assume operation of the pumps in the event of a failure of the main control system. It is a good practice to have the backup system be a different type of control than the main pumping system control. Typically, backup systems are constructed of floats that are installed within the wet well. In addition to the level control systems, it is always good practice to install a flowmeter on the pumping station discharge. This flowmeter will allow the operations staff to review flows from the facility to determine the station reserve capacity, as well as assist in developing capacities for future growth in the collection system. A forcemain conveys the sewage from the pumping station to the outlet sewer. Typically, forcemains are designed to ensure that the velocities inside them are between 0.6 m/sec (2.5 ft/sec) to 1.8 m/sec (8 ft/sec). The minimum velocity of 0.6 m/s (2.5 ft/sec) is required to ensure that solids do not settle within the forcemain and are flushed periodically. This will reduce septic conditions and hydrogen sulfide gas build up within the forcemain. The maximum forcemain velocity of 1.8 m/sec (8 ft/sec) is provided to reduce the energy required to pump the raw sewage through the forcemain. The pressure rating of the forcemain is typically based upon the maximum head developed by the pumps. As the length of forcemain increases, it is possible to reduce the pressure class of the forcemain near the discharge point where pressures are lower due to the lower head losses. Forcemains are typically installed below the frost line, which varies depending upon the region where the sewage pumping station is located. Cleaning of the wet well to remove grit and grease: This is typically undertaken by pumping the wet well and vacuuming the grease and grit into a vacuum truck. Annual maintenance of the pumps and related equipment based upon the manufacturer’s maintenance schedules: This can include changing of the oil within the pumps, inspecting the pump bearings and packing (if installed), and checking for potential leakage through the casings of submersible style pumps. The instrumentation and control systems within the sewage pumping station should be reviewed on a regular basis to ensure that they are calibrated and are functioning properly. Backup instrumentation should be tested to ensure that it will operate when required. Building codes, as well as sewer use bylaws, may limit fats, oils, and grease entering the municipal sewage collection system. To prevent this, an oil water separator can be installed to trap these materials for removal by a third-party contractor. Typically, oil water separators are located on the outlet of a sewer from a facility that is suspected to discharge significant quantities of fats, oil, and grease, including cafeterias and vehicle maintenance areas. The oil water separators are chambers connected to the discharge sewer that include coalescing plates, which allow the fats, oils, and greases to coalesce and collect at the top of the oil water separator. On a periodic basis, these fats, oils, and greases are removed from the oil water separator by a disposal company. A combined sewer is a type of sewer system that collects both sanitary sewage and stormwater runoff. Historically, these sewer systems were common simply because building one system to convey the two types of flows was cheaper than building two separate systems. However, one great disadvantage of the design of the combined sewer system is that during severe storm events, these sewers were usually surcharged or overburdened with excess flow. To alleviate these surcharges, overflows were usually incorporated into the design of the sewer system, thereby diverting excess water through the overflows, which usually led to receiving water bodies. In the 1950s, pollution levels in the receiving water bodies were exceeding acceptable levels and municipalities began to move to a separate two-system design. Today, new communities no longer construct combined sewers system, but many cities still operate their historic systems. As sewage treatment plants were constructed to treat incoming flow from these combined sewers through sewer systems called interceptors. Devices called regulators were installed to actively discharge excess flow into water bodies to protect the treatment plants and connected facilities by preventing overcapacity of the treatment plants themselves, as well as prevent sewer backups and the resulting flooding of homes. Today, many mitigation efforts are employed to reduce the environmentally harmful impacts of combined sewer overflows. Many cities have actively undertaken sewer separation projects by building a second sewer system in all or parts of their communities to collect sewage and thereby relieve the combined sewer to only collect surface runoff. Another mitigation effort is to construct overflow storage facilities such as large underground storage tanks to divert excess flow from combined sewers and alleviate the surcharge. When the storm event passes and flow returns to normal, pumps within the storage tanks start emptying the tank by pumping the stored water back into the sewer system. Treatment basins and disinfection facilities are also used, primarily in the United States, to reduce pollutant levels in combined sewer water, either by stored water treatment or flow-through treatment. Both incorporate the use of screens to collect solid waste and injections of sodium hypochlorite to kill bacteria before discharging the effluent to the receiving water body. The development of a storm drainage system on a university campus would be similar to a storm drainage system developed for most North American municipalities. The purpose of a storm drainage system is to adequately convey runoff, from a range of rainfall events, to an appropriate receiving system. The receiving system may be another storm drainage system or an existing receiving body of water such as a watercourse, lake, or wetland. Whether or not a system is adequate would depend on local context and would include due regard for municipal, provincial or state, and federal guidelines or regulations that address health, safety, and natural environment concerns. A minor system to convey runoff from more frequent rainfall events. (Typically, these are flows up to and including those experienced, on average, once every 5 years or the 1:5-year event. This is also known as the frequency or return period of the rainfall event or the flow.) This is typically conveyed in a storm sewer. A major system to convey runoff in excess of the minor system. (Typically, these are flows up to and including those experienced, on average, once every 100 years or the 1:100-year event. This is also known as the frequency or return period of the rainfall event or the flow.) This is typically conveyed overland by swales, pathways, and roadways. Elements of stormwater management (SWM) over and above the requirements of a strict conveyance system. There has been a recent shift away from traditional stormwater drainage toward a SWM system that also includes water quality control and environmental enhancement. The goal of SWM is to consider runoff as a resource while providing protection to people, property, and existing water resources (including surface water and groundwater) and related natural environments (both terrestrial and aquatic). In the design of a drainage system, with all three of the above components, the designer will most likely use hydrograph techniques in a hydrologic analysis to estimate peak flows while at the same time addressing volume and pollutant loading or removal considerations required for SWM design. These techniques require the use of more complex rainfall-runoff models typically implemented with specialized software. For the design of a drainage system considering conveyance alone, flows can be readily estimated by using simplistic peak flow techniques (such as the “rational method”) employing spreadsheet applications. Flow estimates will then be used in hydraulic analyses to determine water levels (flow depth) and velocities that are the true design characteristics of any water related infrastructure. The implied service life of a storm sewer or SWM facility is indicated by the design return period of the rainfall event used to size the facility. In a risk-based analysis, this return period is balanced with the damage potential for storm events that exceed it, and the true indicator of damage potential is the depth and velocity of flow rather than flow rate. The combined application of hydrologic and hydraulic analysis is commonly referred to as hydrotechnical analysis. Most drainage infrastructure is designed using a synthetic design rainfall based on statistical analysis of local rainfall data. There is also a growing trend to apply significant historical rainfall events to hydrotechnical models to confirm the validity of the infrastructure hydraulic design. To estimate design flows with appropriate return periods, the return period of rainfall in the area is typically used. 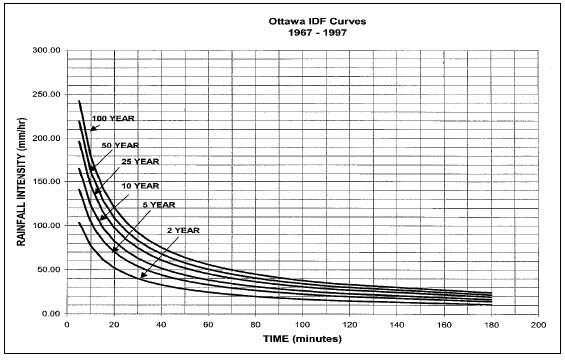 This is most commonly presented as an intensity-duration-frequency relationship (IDF curve) based on statistical analysis of local rainfall records of sufficient duration. These are readily available through local government agencies. An example of an IDF relationship is provided in Figure 2.1. Typically, design flows for the sizing of minor and major systems are determined using the design rainfall with a frequency directly related to the criteria being used. For example, if the storm sewer is to be designed to convey the 1:5-year flow, then a 1:5-year design rainfall is used. Depending on the flow estimation technique being used, rainfall data may either be a single rainfall intensity (typical if the rational method is used) or, if hydrograph techniques are used, it may be a rainfall distribution (hyetograph) based on a rainfall volume related to an appropriate duration and return period. Typical distributions used are Chicago for urban areas and U.S. Soil Conservation Service (SCS) for rural areas. Examples of these hyetographs are provided in Figures 2.2 and 2.3. More sophisticated hydrograph modelling techniques will identify the return period of the flow based on statistical analysis of a long-term series of peak flows generated through continuous simulation of the rainfall-runoff process, rather than basing the return period of the flow on statistical analysis of rainfall data. This method requires long term and detailed rainfall records for adequate implementation. Most municipal or regional jurisdictions will have specific criteria that define the characteristics of major and minor components of a drainage system. A minor system will typically be designed to convey a 1:5-year flow without surcharge, while a major system will be designed to accommodate the 1:100-year flow, in excess of the minor system. As noted above, flow alone does not determine the damage potential of runoff; flow must be translated by hydraulic analyses to flow depth (water levels) and velocities before impacts of changes to land use or system facilities can be assessed. Specific flow, depth, and velocity criteria are typically identified in practices, guidelines, and policies developed by local, regional, and federal government jurisdictions. The difference between risk and probability must be understood. A return period design flow of 1:100 years has a 1 percent probability of being equaled or exceeded in any given year or has an average recurrence interval of 100 years. The probability that it will occur in the next 25 years is 22 percent. Land use and surface cover characteristics, most easily expressed as a runoff coefficient, C, that determines the volume of rainfall that becomes runoff. 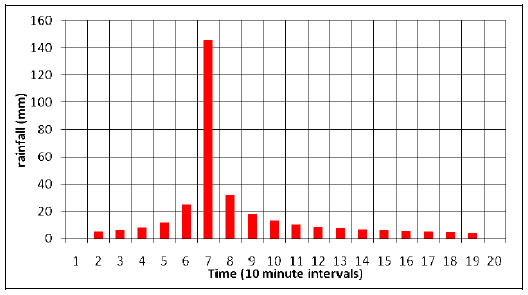 Overland flow and travel time characteristics, most easily expressed as the time of concentration that determines how quickly the runoff achieves its peak. In drainage areas with significant urban land use, C is primarily a function of the degree of imperviousness or impermeability of the ground cover or, conversely, the degree of permeability. Clay soil is less pervious than a sandy soil; similarly, a parking lot with grassy medians will be more pervious than a parking lot that is completely paved. This method is based on an empirical formula (Q=2.78CiA) relating peak flow (Q-liters/second) to drainage area (A-hectares), rainfall intensity (i-mm/hr) and a runoff coefficient (C) and is widely used to size storm sewers. It is usually applied to steady-state conditions (i.e., time is not a factor) where free flow occurs and drainage areas are less than 40 hectares. 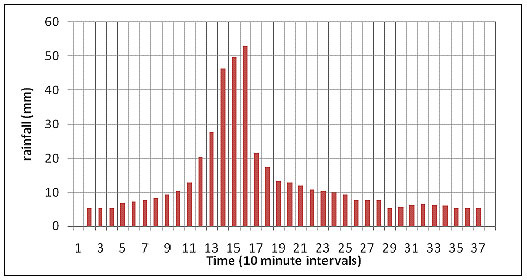 The rainfall intensity ”i” is determined from IDF curves based on a computed time of concentration and C is largely related to the degree of imperviousness of the drainage area. When a major/minor (often referred to as a dual-drainage) system is being considered, or when the volume of runoff is of concern (for example in SWM pond design) a dynamic hydrologic model is required. This type of model provides more realistic results and can include catch basin capture rates, depression storage, infiltration, spatial and temporal variations, and time of concentration. Some examples of these models are DDSWMM, XPSWMM, MOUSE/MIKE URBAN, InfoWORKS, or EPA-SWMM. These types of models typically use design storm hyetographs or continuous rainfall records, and the various discreet drainage areas will have hydrologic characteristics that more accurately model the rainfall-runoff process. These characteristics could include dimensional representations of the impervious areas (slope, length, width), control structures and operations (weirs, gates, orifices, pumps), evaporation, initial abstraction characteristics of the pervious areas (infiltration characteristics including depression storage and infiltration rates) and other related boundary and initial conditions representing ground water, pond, or tide levels. To confirm the adequacy of major and minor systems in conveying design flows, estimates of resulting flow depths and velocities have to be made. Typically, in storm sewer systems, the Hydraulic Grade Line (HGL) should be at or below the crown (also referred to as obvert) of the storm sewer; that is, in a nonsurcharged condition. Surcharging is not desirable but can be accommodated if the HGL does not negatively impact any drainage components, such as foundation drains or sumps, connected to the storm sewer. When assessing HGL impact on a storm sewer system, a dynamic model is preferred since a static model can be overly conservative because it assumes coincident peaks within the system. where Hf is the Head Loss (m) due to friction, f=8g/((R1/6/n))2, v is flow velocity (m/s), L is the pipe length (m), D is the pipe diameter (m), g is the gravitational constant 9.81m/s2, K is a loss coefficient for bends and maintenance holes, R is the hydraulic radius (D/4 for full pipes) and n is Manning’s “n”. When systems become complex due to larger drainage areas and a variety of land uses and components, the analysis of the infrastructure is more effectively evaluated using dynamic hydrotechnical models such as DDSWMM, XPSWMM, MOUSE/MIKE URBAN, InfoWORKS, or EPA-SWMM, which combine hydrologic and hydraulic assessment and can readily and effectively identify surcharge impacts as well as other depth and velocity concerns. Storage facility footprint sizes, freeboard depths, and control structure requirements. When a university campus is developed, there is generally a significant change in land use, typically from rural to urban, with a significant increase in imperviousness and, as a result, a significant increase in runoff and reduced infiltration. There is also a large potential for a change in water quality as the buffering capabilities of a rural environment are removed. Historically, the impacts of the change in land use (development) on water resources were typically addressed by implementing storage facilities that reduced post-development major and minor flow peaks to their pre-development levels. As criteria change and there is more awareness of the impact of the change in drainage patterns due to changes in land use or the drainage system, more recent approaches have introduced SWM elements at various points in the drainage system to more effectively reproduce the original hydrograph pattern from the campus for a range of rainfall events and to provide some form of treatment so that water quality impacts of the change in land use can be mitigated. The intent of these criteria is to reduce the magnitude of peak flows from extreme events and to reduce the magnitude and frequency of minor flows. The criteria will typically be stated as reducing post-development peak flows to pre-development levels. This is typically done for the 2-, 5-, and 100-year Return Period events. However, this does not account for the increased volume of runoff due to land use change. The next section reflects some of the new approaches being used to address this concern. With many regions dependent on groundwater for water supply and many streams and rivers dependent on sustained base flow for the maintenance of adequate fish habitat and related terrestrial environment, there is a need to address the reduction in runoff volume by attempting to preserve the natural or pre-development hydrologic conditions (i.e., surface runoff, infiltration, and evapotranspiration). This can be achieved by the implementation of adequate stormwater management practices as identified below. Water balance is typically assessed on a seasonal or annual basis, rather than for individual design storm events. Best Management Practices (BMP) can consider a range of additional runoff control solutions that address water quantity and water quality concerns and they can be conveniently grouped as source, conveyance, and outlet (end-of-pipe) control. Historically, outlet control was an economical and efficient method of achieving simplistic peak flow control. More recently, emphasis is being placed on consideration of a distributed approach that implements conveyance and source controls rather than a large centralized facility. The emergence of Low Impact Development (LID) guidelines in many municipal jurisdictions is one example of this trend to distributed rather than centralized control. Significant source controls, from the list above, that can impact water quantity considerations, especially in a campus environment, are rooftop storage and combination swale or underground storage systems integrated with parking lots. Conveyance controls include SWM measures along roadways and pathways such as infiltration basins or galleries, exfiltration trenches, pervious technologies (permeable paving, perforated pipe, catch basin and curb-and-gutter systems), vegetated filter strips, roadside ditches and swales (rather than curb-and-gutter storm sewer systems), sediment traps, and oil and grit separator (OGS) units. End of pipe controls typically include oil and grit and SWM detention facilities such as underground tanks or surface ponds (wet, dry, wetlands) designed to address water quantity and quality targets. In considering types of pipe material for sewer installation, the designer must consider the dead loads from the soil above and possibly structures and buildings over the pipe and live loads that will be applied by vehicles and other bodies placed above the pipe temporarily. In areas with cold winters and frost, frost loadings should also be considered, as higher loadings could occur if the frost penetrates close to the pipe. Depending on the soil type, the designer should calculate the frost penetration and determine the appropriate depth to bury to ensure the pipe is not located within the frost zone. If so, then the frost loading should be considered. The sewer pipe selected for a particular application must be able to withstand, with an adequate safety factor, all the combinations of loading conditions that particular pipe may be exposed to for the life cycle expectancy. With respect to internal pressure, sewers are generally gravity systems and subject to minimal internal pressure under surcharge conditions. In the design of sewers under significant surcharge, higher pressure-rated pipe must be selected by the designer. For design methods to be used to calculate earth loading, superimposed loads and the supporting strength of the sewer pipe under various soil and bedding conditions is well documented in design manuals and handbooks for various type of pipe materials. The designer is encouraged to be familiar with these documents. The type of soil and its density and the proposed bedding, surround, and backfill material are important factors for the designer to consider to ensure a satisfactory application. The purpose of the bedding underneath the pipe is intended to bring the trench bottom up to grade as well as to provide a firm, stable, and uniform support for the pipe. The sewer designer working closely with his geotechnical engineer must determine the appropriate selection of bedding material, e.g., granular, and the bedding depth. If the trench bottom is unstable, the removal of the unsuitable material and the placement of a sub-bedding layer of granular material may be required. The material placed from the bottom of the pipe to above the top of the pipe is generally referred to as the “surround material.” It is a very critical component of a sewer pipe installation, as it provides the load support that limits the vertical deflection of the pipe. Pipe support, especially in the haunch zone (invert of the pipe to its spring-line) must be provided by compacting the granular material in both directions from the pipe to the undisturbed trench walls in the case of certain type of pipe material. Backfill is generally the remainder of the trench fill above the pipe and provides additional support for the pipe installation. What is more important in selecting the appropriate backfill material is the potential for differential frost heave between the area over the trench and any hard surfaces, especially in areas with cold winter temperatures. Suitable native materials can normally be used as backfill, provided that organic soils or topsoil is removed, as well all soils to be used must be free of sharp objects, large clumps, frozen material, and boulders. Most soils commonly found have been classified into various categories, i.e., Class 1 to Class 5, Ref ASTM D2487. The pipe selected for a gravity sewer system should be manufactured according to the latest acceptable standards issued by the American Society for Testing Materials, the Canadian Standard Association, or another state, provincial, or federal organization. This usually ensures that the products meet the standards reported by the manufacturer. Should a pipe product not meet a recognized standard, the designer is encouraged to require the supplier to undertake (at the supplier’s expense) the necessary testing normally required by the standard to ensure that the product is acceptable for the particular application. All four stages are characterized by a large amount of physical work, involving coordination between several utilities, the contractor, and the owner of the sewer works. Thus, a large project can extend a long duration and could be disruptive in social, economic, and environmental terms. Conventional open cut method remains a cost effective method, but it could prove disruptive to high-traffic areas or areas with significant landscaping features. The designer should consider these factors in selecting the appropriate construction method. Trenchless technologies used for pipe rehabilitation described here and in Section 4 of the BOK do not constitute a comprehensive list of all trenchless technologies. The reader is encouraged to consult other sources for a complete review of trenchless products. Horizontal directional drilling is a process whereby the installation of underground pipes, conduits, and cables are steered along a prescribed bore path by using a surface-launched drilling rig. It does not involve invasive open cut methods, and thus is advantageous over open cut in that it is not environmentally or socially disruptive, it does not involve human entry, and it is substantially cheaper. It is also useful for installing pipelines in difficult areas such as waterways, roadways, or environmentally sensitive areas. The process involves drilling a pilot hole led by a drilling head followed by a drilling string. The drilling head is guided usually by a transmitter located behind the drilling head, which sends electromagnetic signals that can be picked up through the ground and detected by a worker with a hand-held detection receiver. Once the drilling head and string reach the target location, a back reamer is attached, which travels backward toward the entry point to enlarge the bore hole to the appropriate diameter, allowing the utility (pipe or casing) to follow and be easily installed. Micro tunneling is used to construct small tunnels using a micro tunnel boring machine that is operated remotely. The new pipe or conduit to be installed is pushed behind the boring machine in a process referred to as pipe jacking. One disadvantage to pipe jacking is the friction between the surrounding soil and the outer edge of the pipe being inserted. One application to counteract friction is over-cutting using a cutter wheel to ensure a slight gap between the soil and the pipe, followed by injection of a bentonite slurry into the gap to provide lubrication, and fill the void. A large jacking frame is required to produce enough force to push the boring machine and pipe into the ground. This is a pneumatic process whereby percussive blows drives a pipe into the ground. The shape of the pipe usually has to allow for a small over cut to reduce friction between the pipe and the soil, or the use of lubrication such as bentonite or polymers can be applied to reduce friction. The shape of the pipe also has to be such as to direct the soil into the pipe interior (known as the spoil) instead of compacting it outside the pipe. Spoil removal from the pipe can be done by auger, compressed air, or water jet. Usually for long installations, spoil removal is done periodically to ease the installation process. Jack and bore, or auger bore, consists of a rotating cutting head and auger internal to a pipe or casing that is being advanced hydraulically. The pipe or casing is advanced ahead of the cutting head allowing the soils to be enveloped within the auger, which turns to remove the soils while the hydraulics advance the pipe or casing. The advantage of such a system is that no voids in the surrounding soils are created while the pipe is being "jacked" into place. Sewer systems must be evaluated for financial planning (e.g., system operations budget as well as capital budgeting for improvements and replacement). As a university campus expands, the demands on infrastructure continue to grow and the capacity and condition of facilities must be continually evaluated. Because sewer systems are designed for service lifetimes of 30 to 50 years or more, planning of these systems should include replacement costs. However, this is most often not the case; therefore, it is important that infiltration/inflow (I/I) be minimized and that the necessary investment be made during the lifetime of existing facilities to preserve the system's condition and capacity. Timely rehabilitation can extend the service lifetime of sewer systems and save campuses the large expenditures required to replace deteriorated sewers. A preliminary sewer system analysis should be performed first to determine if there are serious I/I problems in order to evaluate the extent of these problems and to select the approach for further analysis and investigation. The scope of the preliminary sewer system analysis depends on the size of the system and the amount of information available. The survey can best be conducted by outside consultants that specialize in hydraulic and condition assessment. The major purposes for conducting the survey are to identify and prioritize those sewer system subareas with the greatest potential problems and to scope out subsequent investigations. The preliminary survey is a forerunner to traditional I/I and sewer system evaluation survey (SSES) procedures and includes limited flow monitoring at critical junctions, review of maintenance records, limited visual investigation, and possibly limited CCTV inspections. By definition, I/I is the rainfall related extraneous flows entering a sewer system. Infiltration is extraneous groundwater flow that enters sewers and sewer connections primarily through defects such as leaky joints, broken or cracked pipes, deteriorated maintenance holes, or faulty connections. Infiltration also includes groundwater flow discharging into a connected foundation drain. Inflow is surface water that is discharged into existing sewer lines from such sources as roof leaders, sumps, floor and yard drains, and storm drains. In the case of a sanitary sewer system, excessive I/I contribution reduces the effective capacity of the sanitary system of which the main function is to collect domestic sewage flows, and thus would not necessarily be sized to carry additional water loads such as stormwater runoff. In the case of storm sewer pipes, they are generally designed to carry the minor system (1:5-year); runoff in excess of the 1:5-year event is to be managed via overland routes or stormwater management controls. Therefore, the rainfall related contribution to the storm minor system needs to be assessed to ensure that flows in excess of the 1:5-year event are redirected elsewhere to avoid surcharging and possibly basement flooding. The difference between infiltration and inflow is as follows: I/I is the major deterrent to the successful performance of a wastewater conveyance and treatment system. Problems with I/I develop when infiltration and inflow become excessive, leading to sewer surcharging, overflows, and backups. Control of I/I is an essential part of sewer system maintenance and an integral part of overall system rehabilitation. The purpose of the Sewer System Evaluation Survey (SSES) is to quantify the amount of rainfall-induced infiltration and inflow that can be reduced and the cost of such reduction on a source-by-source basis. The SSES confirms and refines the overall findings of the I/I analysis. The findings of the SSES should be sufficiently specific to describe the corrective actions needed and to accurately account for the amount of rainfall-induced infiltration and inflow that will be eliminated from each major sewer segment or source. The SSES must separately define the cost-effectiveness of infiltration and inflow removal. In general, an evaluation survey geared towards reducing infiltration will focus on the natural deterioration of a sanitary or storm sewer system that will permit water entry, such as broken pipe, cracks, fractures, or roots intrusion, whereas an evaluation survey geared towards reducing inflow will focus on deliberate errors in construction of the sewer system that will permit water entry primarily into sanitary sewers, such as deliberate storm-sanitary cross connections, foundation connections to sanitary, or roof drain connections to sanitary. The results of a rain-gauged, flow monitoring program can assist in determining the rainfall related extraneous flows entering the sanitary sewer system or the flows in excess of the capacity of the storm sewer minor system. The monitoring program records the average dry weather flow and the total flow hydrographs during the rainfall event. Extraneous flow is calculated by subtracting the average daily dry weather flow from the total wet weather flow. Extraneous flow due to infiltration is often characterized by a general rise in the base flow that is independent of storm events—that is, it is usually a groundwater effect—whereas extraneous flow due to inflow is often characterized as being reactive with storm events, having a sudden peak in flow above base flow during the event, and gradually returning to dry weather base flow following the end of the event. Obviously, rehabilitative priority should be assigned to those sewer systems having a high impact rating (4 or 5). Failure impact ratings can be used not only for identifying priorities for inspection, condition assessment, and rehabilitation, but also for planning and constructing new sewer systems in such a way as to limit high failure impact factors. Inspections are arguably the most effective way to manage assessments of sewer systems. Inspections are very useful in that they provide information on the current physical condition of sewers, provide rates of material deterioration, and forecast future needs and timing for repair or rehabilitation. One of the most practical and common methods of inspecting a pipe system for defects is through the use of closed circuit television (CCTV). This procedure entails the use of a robotic camera to travel the length of a given pipe segment, while being operated and viewed by a CCTV crew on the surface. Preparatory cleaning of the sewers is required prior to inspection. Debris in sewer inverts, grease accumulation, and heavy root infestations not only obstruct visual or video inspection, but also may hide or mask actual infiltration sources. The task of assessing sewer systems through the use of CCTV is a detailed procedure, requiring CCTV operators to be certified by the North American Association of Pipeline Inspectors (NAAPI). NAAPI was established in May 1994 with the aim of improving the overall quality of the CCTV sewer inspection industry by introducing a standardized method of conducting and reporting sewer inspection surveys. Through NAAPI’s mandate, a standard for CCTV equipment and procedures, as well as a standard pipe defect coding system were developed through the adoption of an internationally accepted Manual of Sewer Condition Classification published by the Water Research Centre (UK, 1980; 4th edition: December 2003). Many jurisdictions have adopted their respective specification for CCTV inspection from this document. Data collected using CCTV inspection of sewer systems are used to assess the condition of the sewer. Condition assessment, and thus priority of maintenance or repair work, is assigned using a rating system. It is important to distinguish two general types of defects encountered in sewer systems: structural and serviceability deficiencies. Structural deficiencies are those affecting the physical structure of the pipe system itself. Many such defects include: fractures, cracks, deformation, collapse, broken pipe, joint displacement, joint opening, surface damage (buckling, corrosion, spalling, wear), and sag. Depending on the severity of each defect (light, moderate, or severe) each of these defects are assigned "weights." For example, if a longitudinal fracture was encountered in a sewer, a light fracture would be less than 10 mm wide and be assigned a weight of 5, a moderate fracture would be between 10 mm and 25 mm and be assigned a weight of 10, and a severe fracture would be greater than 25 mm and be assigned a weight of 15. Once the weight assignment is determined for the specific sewer pipe, it is converted to a pipe condition rating. See Table 3.2. A structural condition rating of 0–2 indicates no immediate action is required; sewer is excellent, very good, or good shape respectively; a rating of 3 indicates that no immediate action is required, but another inspection should be conducted within the next year; a rating of 4 means that action (repair) is required within a year; a rating of 5 indicates immediate action required and that structural failure is imminent. "weights" depending on the severity of each defect (light, moderate, or severe). For example, if debris was encountered within a given pipe segment, light debris resulting in a pipe diameter reduction of less than 10 percent would be assigned a weight of 5, moderate debris resulting in a pipe diameter reduction of between 10 percent to 25 percent would assigned a weight of 10, and severe debris resulting in a pipe diameter reduction of greater than 25 percent would be assigned a weight of 15. All weights assigned to all serviceability defects encountered within a pipe segment would be tabulated in the same manner as described for structural defects and are all described in Chapter 5 of the NRC’s Guidelines for Condition Assessment and Rehabilitation of Large Sewers. Once the weight assignment is determined for the specific sewer pipe, it is converted to a pipe condition. See Table 3.3. A serviceability condition rating of 0–2 indicates that no immediate action is required; sewer is excellent, very good, or good shape respectively; a rating of 3 indicates that no immediate action is required, but another inspection should be conducted within the next year; a rating of 4 means that action (maintenance) is required within a year; a rating of 5 indicates that immediate maintenance is required. Both the structural and serviceability condition assessments described above for pipe segments can also be applied for maintenance holes. There are some slight differences with the weighting assignments, and there are different defects that are unique to maintenance holes, but generally the process is essentially the same. For maintenance holes, structural defects include vertical fractures, horizontal fractures, broken area, vertical crack, horizontal cracks, deformation, collapse, surface damage, frame damage, cover damage, and ground surface settlement. Fractures, cracks, deformation, and damages are rated as light, moderate, or severe, whereas holes and collapse are assigned only one grade. Serviceability defects include roots, unsafe ladder, unsafe landing, connection faults, and infiltration. Again, these defects are rated light, moderate, or severe. For a given maintenance hole, the condition rating (structural/serviceability) together with the failure impact rating will establish the rehabilitation priority. The reader is asked to refer to the document published by the NRC: Guidelines for Condition Assessment and Rehabilitation of Large Sewers. A smoke test is a technique used to identify sections of sewers (primarily sanitary) that may exhibit inflow from sources such as roof leader connection to sanitary sewers, or open drains such as yard or driveway drains which connect to sanitary sewers. The procedure is "outflow-specific" in that testing starts at the sewer, and is traced back to the suspected source. It involves placing smoke blowers on a particular maintenance hole which emit nontoxic smoke under pressure through the sewer line. Under ideal conditions whereby there are no connections to the sanitary sewer, the smoke should be able to escape only out of the vent stacks of homes, whereas if there is a connection to the sanitary sewer, the smoke will lead to the source of that connection—be it a roof drain, storm drain, or sewer. A dye test is a technique used to identify sections of sewers (primarily sanitary) that may exhibit inflow from sources such as weeping tiles (foundation drains), as well as roof drains or suspected storm connections. The procedure is more source-specific than the smoke test, in that dye is usually introduced at the suspected source, to be traced or observed at the sewer. Obviously, the presence of dye in the sewer indicates a positive connection from the suspected source. The use of CCTV can also be applied to film suspected lines or connections to sewers, such as foundation drain connections to sanitary sewers. The survey report summarizes the results obtained during the survey and presents a cost-effectiveness analysis of the I/I sources that can be economically corrected. The SSES cost-effectiveness analysis provides a detailed and thorough analysis of the sewer system, including the I/I flow rates from each source and the best method for rehabilitation of each source. For an effective cost analysis, the cost of correction for infiltration, inflow, rainfall-induced infiltration, and groundwater migration must be considered. Subarea SSES analysis, including migration effects, is an improved approach to the traditional point source method for evaluating sewer systems. Flow adjustments for infiltration should be performed before the cost-effectiveness analysis is conducted. Costs for rehabilitation should be based on the actual physical conditions observed. The cost for infiltration and inflow correction must be estimated separately. Pipeline replacement can be done in two general ways. Excavation and replacement can be done in the same alignment as the former pipeline, or the existing pipeline can be abandoned in place and the new pipeline placed in a parallel alignment. The parallel alignment can be either immediately adjacent to the existing line or parallel to it along a different route. Abandoned pipes must be filled with structurally sound material to prevent collapse. Pipeline replacement materials include reinforced concrete, clay, ductile iron, and a variety of plastics. Disadvantages of pipeline removal and replacement include high costs, disruption of traffic and access to buildings, damage or interruption of other underground utilities, removal and disposal of old pipes, trench shoring requirements, and dewatering (in areas of high groundwater). Grouting is a joint sealing technique, normally used to control groundwater infiltration in unpressurized pipelines where infiltration is caused by leaking pipe joints, circumferential cracks, radial cracks, or even small holes. It is usually not recommended for deformed or longitudinally cracked pipe sections. Chemical grouting does not improve the structural strength of the pipeline and therefore should not be used when the pipe is severely cracked, crushed, or broken. The most common chemical grouts currently available are acrylamide gel, acrylic gel, urethane gel, and polyurethane foam, and they can be applied to pipeline joints, maintenance hole walls, wet wells in pump stations, and other leaking structures using special tools and techniques. All chemical grouts are applied under pressure after appropriate cleaning and testing of the joint; for effective grouting, the pipeline must be relatively clear of sand, sediment, and other deposits. Slip lining entails the insertion of a new pipe within an existing pipe. It is used primarily for rehabilitating aging pipelines with extensive fractures, cracks, or severe root intrusion. It can also be used for pipelines located within unstable soils, corrosive environments, and high groundwater tables. Ideally, this method should be used for pipelines with moderate grades and moderate horizontal or vertical deflections, and it does require minimal excavation for an access pit. The insertion process is rapid, and can often be completed during periods of low flow. However, slip lining may reduce pipe and sewer capacity, and requires removal of internal obstructions. The most popular materials used to slip line sewer pipes are polyolefins, fiberglass-reinforced polyesters (FRPs), reinforced thermosetting resins (RTRs), polyvinyl chloride (PVC), and ductile iron (cement-lined or polyvinyl-lined). Polyethylene is the most common polyolefin material used and is available in low, medium, and high density. High-density polyethylene compounds are best suited for rehabilitation applications because they are hard, strong, tough, corrosion-resistant, and have good stiffness. Polybutylene is similar to medium-density polyethylene pipe in stiffness and chemical resistance but has better continued stress loading characteristics and good temperature resistance. FRP pipe is frequently specified as an acceptable alternative to polyethylene because it has good chemical and corrosion resistance and is suitable for use over a wide pH range. RTR pipe has high strength and elasticity, and good corrosion, erosion, and abrasion resistance. Flexible PVC is highly resistant to acidic corrosion and is very smooth, exhibiting good hydraulics. Grouting of the annular space is required to give strength to the PVC pipe. Slip lining is performed by either a push or pull technique. Once the liner has been inserted, it is grouted in place. Grouting at maintenance hole connections is required, but grouting of the entire length of pipe may not be necessary if the liner is strong enough to support loads in the event of collapse of the original pipe. This method, used since 1988, can be considered as an improved version of slip lining. The process uses a folded thermoplastic (polyethylene or PVC) pipe that is pulled into place and then rounded to conform to the internal diameter of the existing pipe. Excavation is not required for installation when there are existing maintenance hole access points, and lateral reopening is done internally. The finished pipe has no joints and fits moderately tightly against the existing pipe wall. The plastic piping has excellent corrosion resistance. This method is less versatile than inversion lining in terms of pipe diameter range and installation lengths, and only slight offsets and bends can be negotiated. There are currently two fold-and-formed processes commercially available in the United States: U-Liner and NuPipe. The U-Liner technology uses a high-density polyethylene resin U-shaped pipe wound onto spools ready for installation. After cleaning and television inspection and analysis to identify defects and determine the applicability of this method, a pre-engineered seamless coil of precut pipe is winched into place. The pipe is pulled off a spool at ambient temperature, fed through an existing maintenance hole, and winched through the existing pipe to the terminal point. Once the pipe is in place, steam is fed through the inside of the folded pipe, softening the plastic to allow for reforming inside the existing pipe. After the plastic has been heated, pressure is used to re-round the pipe. Sufficient time must be allowed for the system to stabilize before the end treatment is finished and the laterals are reopened using a remote-controlled cutter head. The NuPipe product is made of PVC and extruded in a folded shape onto spools while still pliable. Installation includes cleaning of existing pipe along with a television inspection to determine the extent of deterioration and to verify the applicability of this method. A flexible reinforced liner called a heat containment tube (HCT) is inserted into the existing pipeline to provide a closed environment for installation and processing. After the HCT has been strung through the existing pipeline, the folded PVC is heated while on a spool and is pulled through the pipeline. Once the NuPipe has reached the termination point, steam is introduced both through the interior and around the exterior of the folded pipe. After the PVC becomes pliable, a rounding device is introduced into one end of the pipe and propelled through the folded pipe, moving standing water out while expanding the plastic tightly against the existing pipe wall, creating a mechanical lock at the joints and laterals. Cold water is then injected into the NuPipe to solidify the plastic. The pliable nature of the resin-saturated tubing used in inversion lining allows it to be installed around curves and maneuvered through pipe defects. Inversion lining is successful in dealing with a number of structural problems, particularly in sewers requiring minor structural reinforcement. However, caution must be used in applying this method to pipelines with major loss of sidewall. Inversion lining can be done relatively quickly and does not require excavation, making it especially suitable for repairing pipelines around structures, in congested areas, and in areas where traffic disruption must be minimized. It can be used in noncircular pipes and pipes with irregular cross-sections. This method is also effective in correcting minor corrosion problems and can be used to bridge gaps and misaligned joints. The new lining has no joints or seams and has a smooth interior surface, which may actually improve flow capacity despite slightly decreasing pipe diameter. Inversion lining is formed by inserting a resin-impregnated fabric tube (turned inside out) into the existing pipeline and inverting it as it progresses inside the pipeline. It is then cured in place through the use of heated water or steam. Prior to installation of the liner, the pipeline section must be cleaned to remove loose debris, roots, protruding service connections, and excessive solids. The pipeline segment must be isolated from the system and requires bypassing of flows during installation of the inversion lining. The liner is usually inserted via existing maintenance holes. After the lining system has been installed and cured, a special cutting device is used with a CCTV camera to reopen service connections identified prior to installation. Specialty concrete containing sulfate resistant additives is used to reinforce weakened concrete pipes and maintenance hole structures through application of an acid-resistant coating over the original surface. Specialty cement can resist attack by many substances, including mineral salts, mild solutions of organic and mineral acids, sugar solutions, fats, and oils. Applicability of this method depends on the degree of corrosion-related deterioration and the structural integrity of the sewer. Specialty concrete is available in three types: cement mortar, gunite (shotcrete), and cast concrete. These techniques require sewer cleaning to remove oils and greases, foreign objects, and loose materials. Wastewater must be bypassed during application and initial curing. Mortar lining is applied using a centrifugal lining machine and is a successful rehabilitation technique for sewer lines, maintenance holes, and other structures. Reinforcement can also be added to the mortar with a reinforcing spiral-wound rod that is inserted into the mortar, with a second coat applied over it. Gunite, or shotcrete, is a low-moisture, high-density mixture of fine aggregate, cement, and water. It is used on man-entry-size (32 inch or 800 mm) or bigger sewers and on maintenance holes. Gunite bonding with the original surface is usually stronger than the base material itself, with better adhesion on more deteriorated and irregular piping. The gunite is applied under pressure by a self-propelled, operator-controlled lining machine after reinforcing steel is set into place. Cast concrete is silicate-bonded, poured, or cast-in-place structural concrete with about half the density or strength of gunite. It is poured over prefabricated or hand-built interior pipe forms that can be removed and reused. Reinforcing steel is added prior to application. Pipe bursting is the process whereby old pipes are upsized with larger, higher capacity pipes, which upon insertion, literally burst, or break apart the smaller pipe. The process involves two small pit excavations for an insertion pit and a reception pit. An expander head is inserted at the insertion pit and is pulled by a wrench at the reception pit. The expander head is slightly larger than the diameter of the old pipe (and some even incorporate fins around the expander head) to ensure that the old pipe is broken as the new pipe, which is attached behind the expander head and wrenched into place. The old pipe is not removed; the busted remnants remain within the surrounding soil of the newly drawn pipe. A disadvantage to pipe bursting is that the surrounding soil conditions may not be optimal for the newly drawn pipe in that the pipe would not be properly supported and eventually sag. Surrounding soils of old pipes should be tested for composition and density before considering pipe bursting. Maintenance hole rehabilitation methods focus on either the frame and cover, or the sidewall and base. Maintenance hole frame and cover rehabilitation prevents surface runoff from flowing into the maintenance hole through holes in the cover lid, into the annular space around the lid and framed cover, or under the frame if it is improperly sealed. Generally, the installation of a new frame and cover is the best technique to ensure proper sealing. Application of waterproof and corrosion-resistant epoxy, acrylic, or polyurethane-based coatings to interior maintenance hole walls: These can be applied by towel brush or sprayer to brick, block, or precast concrete maintenance holes and bases. Prior to coating application, man-hole wall surfaces should be clean and dry and all leaks plugged using patching or grouting materials. The maintenance hole must be structurally sound. Application of chemical grout from the interior walls to the exterior walls to stop infiltration through cracks and holes: This is an inexpensive method but has a short service life. Insertion of fiberglass-reinforced polyester structural liners inside maintenance holes to provide structural restoration: This has a longer service life than coatings, but installation may be costly. Insertion of preformed polyethylene liners that are grouted in place: These require removal of the maintenance hole cone or top for insertions. Service laterals connect buildings to main sewer lines and can be a significant source of infiltration through defects such as cracked, broken, or open jointed pipes. Service connections may also carry water from inflow sources such as roof and foundation drains, basement sump pumps and floor drains, and various stormwater runoff sources. The most common rehabilitation methods for service laterals are chemical grouting and inversion lining. The following three chemical grouting methods are commonly used: pump full, sewer sausage, and camera-packer. In the pump full method, chemical grout is injected through a conventional sealing packer from the sewer main into the service connection to be grouted. The sewer sausage method is similar to the pump full method, except that a tube is inverted into the service connection before sealing to reduce the quantity of grout used and to minimize the amount of cleaning required after completion of the sealing. The camera-packer method uses a miniature television camera in conjunction with a specialized sealing packer that is pulled through the lateral, repairing faults viewed through the camera. Inversion lining is similar to main sewer installation and involves the insertion of a resin-impregnated flexible polyester felt liner into the service lateral. No annular space is created between the liner and the existing pipe that could result in infiltration migration. No prior excavations are required to repair slight offsets. An access point is needed on the upstream side of the service connection line. After completion of the curing process, the downstream end of the liner is cut manually or with a remote-controlled cutting device placed in the sewer main. The upstream end is trimmed at the access point prior to restoration of the service connection. American Consulting Services, Inc. Sewer System Evaluation for Infiltration/Inflow. 1973. Paper prepared for Technology Transfer Program, Environmental Protection Agency. Minneapolis: American Consulting Services, Inc.
American Public Works Association. 1970. Control of Infiltration and Inflow into Sewer Systems. Publication No. 11022 EFF 12/70; NTIS Publication No. PB200827. Washington, DC: Water Quality Office, Environmental Protection Agency, and 39 local government jurisdictions. American Public Works Association. 1971. Prevention and Correction of Excessive Infiltration and Inflow into Sewer Systems—Manual of Practice. NTIS publication No. PB-203208. Washington, DC: Water Quality Office, Environmental Protection Agency, and 39 local government jurisdictions. American Public Works Association. December 1977. Sewer System Evaluation, Rehabilitation, and New Construction—A Manual of Practice. Publication No. EPA/ 600/2-77/017d. NTIS Publication No. PB-279248. Cincinnati, OH: Municipal Environmental Research Laboratory, Office of Research and Development, Environmental Protection Agency. Brown and Caldwell, Inc. 1984. Utility Infrastructure Rehabilitation. HUD Report No. HUD-0004113. Washington, DC: Department of Housing and Urban Development. Brown and Caldwell, Inc. 1985. "Deciding to Rehabilitate, Repair, or Replace (Condensed from Utility Infrastructure Rehabilitation)." Water Engineering & Management, Vol. 132, pp. 50-53. Washington, DC: Department of Housing and Urban Development. Brown and Caldwell, Inc. 1985 "Evaluating Utility System Conditions (Condensed from Utility Infrastructure Rehabilitation)." Water Engineering & Management, Vol. 132, 1985, pp. 43-49. Washington, DC: Department of Housing and Urban Development. Camp Dresser and McKee, et al. March 1993. California Best Management Practice Handbooks, Volumes 1–3. Stormwater Quality Task Force. Carter, William C., A. J. Hollenbeck, and R. J. Nogaj. 1986. "Cost Effectiveness and Sewer Rehabilitation." Public Works, Vol. 17, pp. 64-67. Center for Environmental Research Information, Office of Research and Development. 1985. Odor and Corrosion Control in Sanitary Sewerage System and Treatment Plants. Publication No. EPAJ625/1-85/018. Cincinnati, OH: Environmental Protection Agency. City of Ottawa. Nov 2004. Ottawa Design Guidelines (Sewer), 1st edition. Collection Systems Digest (Compendium of articles published in Water Environment & Technology or presented at WEF annual conference). 1993. Publication No. P0036GA. Alexandria, VA: Water Environment Federation. Collection Systems Operation and Maintenance (Proceedings of Water Environment Federation Conference, Tucson, AZ, June 1993). Publication No. TTIM4GA. Alexandria, VA: Water Environment Federation. Collection Systems Symposia (Proceedings from 65th Annual WEF Conference in New Orleans, Louisiana, September 1992). Publication No. C2006GA. Alexandria, VA: Water Environment Federation. Darnell, Paul E. 1976. "Conducting Sewer System Evaluations for Small Systems." Water & Sewage Works, Vol. 123, pp. 68-71. Environmental Protection Agency. 1991. Analysis and Rehabilitation Handbook. Publication No. EPA/625/6-91/030. Cincinnati, OH: Office of Research and Development. Existing Sewer Evaluation and Rehabilitation—Manual of Practice #FD-6. WPCF Publication No. MFD6GA. 1983. ASCE Manuals and Reports on Engineering Practice No. 62. Alexandria, VA: American Society of Civil Engineers/Water Pollution Control Federation. Fernandez, R. B. 1986. "Sewer Rehab Using a New Subarea Method." Water Engineering & Management, Vol. 133, pp. 28–30. Handbook for Sewer System Evaluation and Rehabilitation. 1975. Publication No. EPAJ 430/9-75-021. Washington, DC: Municipal Construction Division, Office of Water Program Operations, Environmental Protection Agency. Heinecke, T. L., and C. H. Steketee. 1984. "The Key to Effective I/I Control." Public Works, Vol. 115. Hollenbeck, A. J. 1984. "Designing for Removal of Sanitary Sewer Cross Connections." Water Engineering & Management, Vol. 131, pp. 29–31. Joint Committee of American Society of Civil Engineers and Water Pollution Control Federation. 1969. Design and Construction of Sanitary and Storm Sewers—Manual of Practice #9. Publication No. M0010GA. Alexandria, VA: American Society of Civil Engineers/Water Pollution Control Federation. Metcalfe & Eddy Inc. 1991. Wastewater Engineering – Treatment, Disposal, Reuse, 3rd edition (as revised by George Tchobanoglous and Franklin L. Burtion), Irwin McGraw Hill. National Association of Sewer Service Companies (NASSCO). August 1987. Recommended Specifications for Sewer Collection System Rehabilitation, 5th edition. Altamonte, FL: National Association of Sewer Service Companies (NASSCO). National Research Council Canada. 2001. Guidelines for Condition Assessment and Rehabilitation of Large Sewers. Published by the Institute for Research in Construction, National Research Council Canada. National Water Well Association, RJN Environmental Associates, Inc., and Washington Suburban Sanitary Commission. 1984. Impact of Groundwater Migration on Rehabilitation of Sanitary Sewers. Hyattsville, MD: Washington Suburban Sanitary Commission. North American Association of Pipeline Inspectors (NAAPI). 2007. Manual of Sewer Condition Classification, 2nd edition. Office of Water. July 1992. NPDES Stormwater Sampling Guidance Document. Publication No. EPA 833-B-92-001. Washington, DC: Environmental Protection Agency. Office of Water Program Operations. March 1974. Guidance for Sewer System Evaluation. Washington, DC: Environmental Protection Agency. Recommended Standards for Sewage Works. 1978. Policies for the Review and Approval of Plans and Specifications for Sewage Collection and Treatment. A Report of the Committee of the Great Lakes Upper Mississippi River Board of State Sanitary Engineers (Ten-States Standards). RJN Environmental Associates, Inc. National Alternative Methodology for Sewer System Evaluation. Hyattsville, MD: Washington Suburban Sanitary Commission, 1988. Roy E Weston, Inc. 1984. Determination of Excessive/Nonexcessive Inflow Rates. Study conducted under EPA Contract No. 68-01-6737. Washington, DC: Municipal Construction Division, Office of Water Program Operations, Environmental Protection Agency. Smith, J. M., and Associates. 1984. Analysis of Acceptable Ranges for Infiltration and Inflow Reduction in Sewer System Rehabilitation Projects. Study conducted under EPA Contract No. 68-01-6737. Office of Municipal Pollution Control, Environmental Protection Agency. Smith, J. M. and Associates, HydroQual, Inc. 1991. Report to Congress: Hydrogen Sulfide Corrosion in Wastewater Collection and Treatment Systems. Publication No. EPAJ430/9-91/009. Washington, DC: Office of Water, Environmental Protection Agency. Task Force on Alternative Sewer Systems. 1986. Alternative Sewer Systems-Manual of Practice #FD-12. Publication No. MDF12GA. Alexandria, VA: Water Pollution Control Federation. Urban Water Resources Research Council of American Society of Civil Engineers and Water Environment Federation. 1992. Design and Construction of Urban Stormwater Management Systems—Manual of Practice #FD-20. Publication No. MFD20GA. Alexandria, VA: American Society of Civil Engineers/Water Environment Federation. Water Environment Federation Technical Practice Committee. 1992. Wastewater Collection Systems Management—Manual of Practice #7. Publication No. M0007RGA. Alexandria, VA: Water Environment Federation. Water Pollution Control Federation. 1982. Sewer Charges for Wastewater Collection and Treatment—A Survey. Publication No. M0035GA. Alexandria, VA: Water Pollution Control Federation.